The cover of the 2015 National Audubon Society annual report. NC Audubon Bird-Friendly Communities Coordinator Kim Brand scans the canopy for birds at Pilot Mountain in Pinnacle, N.C.
FROM LEFT: Tim Guida of the Smithsonian Migratory Bird Center, Kim Brand of the Forsyth Audubon Society and volunteers David Shuford, Jean Chamberlain and Kim Thorington during a break from capturing Wood Thrushes at Pilot Mountain in Pinnacle, N.C.
Wood Thrushes love deciduous forests with high canopies, moist ravines and streams. 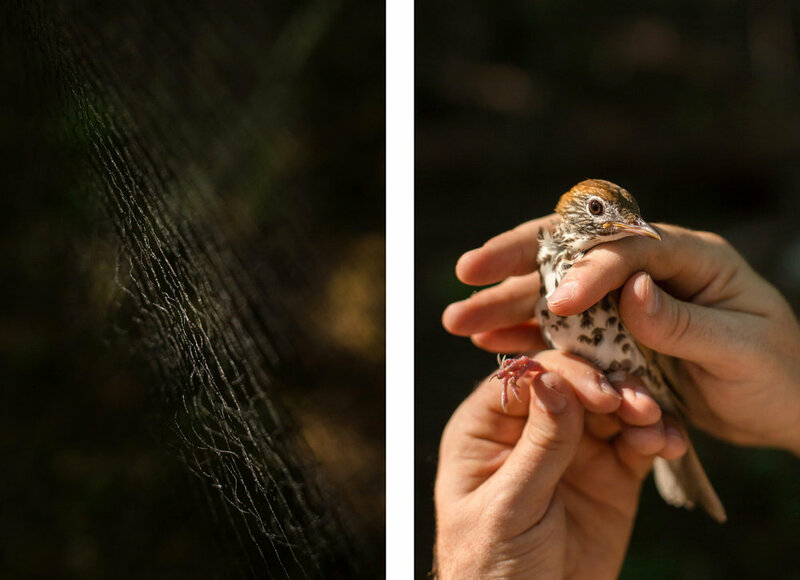 A Wood Thrush caught in a mist net. The nets do not harm the birds. A mist net used to catch birds is illuminated by a sunbeam. Tools used to catch, band and release Wood Thrushes. Forsyth Audubon volunteer Jean Chamberlain, left, takes Wood Thrush measurements from scientist Tim Guida at Pilot Mountain in Pinnacle, N.C.
NC Audubon Bird-Friendly Communities Coordinator Kim Brand stops for a portrait. Volunteers Jean Chamberlain and Kim Thorington set new mist nets. Binoculars and a GPS collar used to track Wood Thrush movements. Jean Chamberlain, Kim Thorington, Tim Guida and Kim Brand pause after trapping Wood Thrushes at Pilot Mountain State Park. Inside spread of the 2016 Audubon Annual Report.